Bead, glass, metallic cobalt, 8mm bicone. Sold per 15" to 16" strand. Faceted glass bicone beads send full coated colorful flashes of light in all directions. Machine cut for consistency. Bead, glass, metallic cobalt, 4mm bicone. Sold per 16-inch strand. 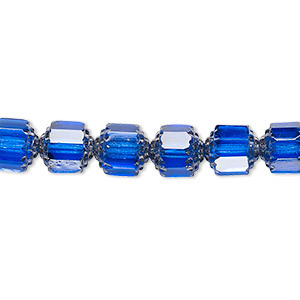 Bead, Celestial Crystal®, translucent cobalt AB, 8mm faceted bicone. Sold per 15-1/2" to 16" strand, approximately 50 beads. Bead, Celestial Crystal®, translucent cobalt, 8mm faceted bicone. Sold per 15-1/2" to 16" strand, approximately 50 beads. 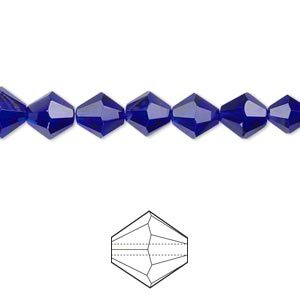 Bead, Celestial Crystal®, translucent cobalt AB, 4mm faceted bicone. Sold per 15-1/2" to 16" strand, approximately 100 beads. Bead, Celestial Crystal®, translucent cobalt AB, 6mm faceted bicone. Sold per 15-1/2" to 16" strand, approximately 65 beads. Bead, Celestial Crystal®, translucent cobalt, 4mm faceted bicone. Sold per 15-1/2" to 16" strand, approximately 100 beads. Bead, Celestial Crystal®, translucent cobalt, 6mm faceted bicone. Sold per 15-1/2" to 16" strand, approximately 65 beads. Bead, Czech glass, cobalt and metallic silver, 8mm round cathedral. Sold per 15-1/2" to 16" strand, approximately 50 beads. 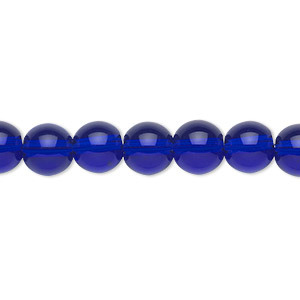 Bead, glass, cobalt blue, 8mm round. Sold per 36-inch strand. 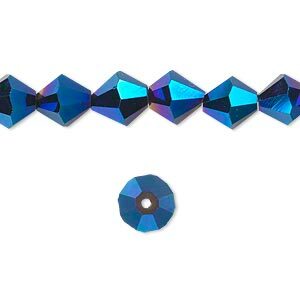 Bead, Celestial Crystal®, glass, 16-facet, cobalt, 4-10mm graduated faceted bicone. Sold per 18-inch strand.